Chursinite: Mineral information, data and localities. 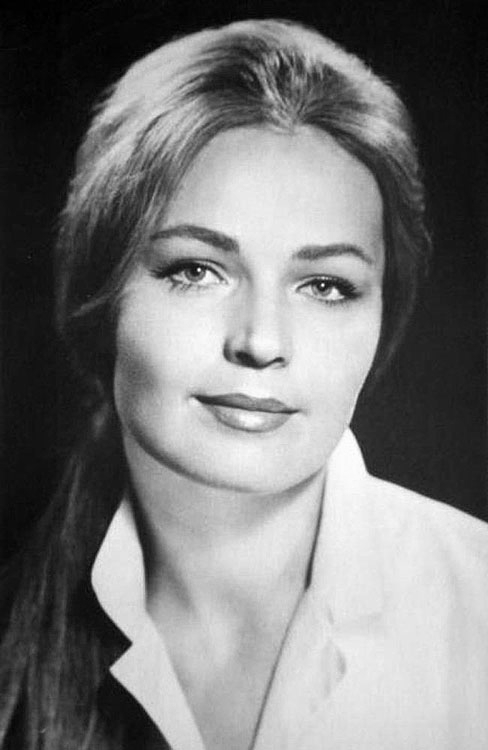 In honour of the Russian theatre and film actress Lyudmila Alekseevna Chursina (1941– ). 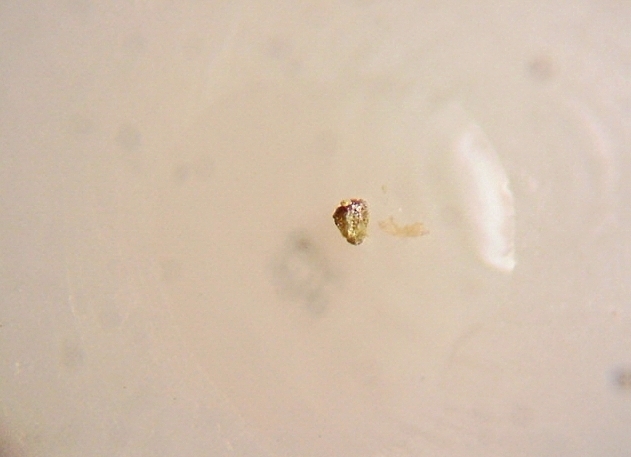 Second mercury arsenate mineral after kuznetsovite. 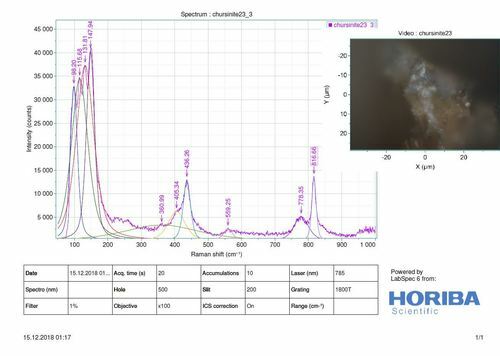 Weil (2004) reports chursinite as the α-(Hg2)3(AsO4)3. In the crystal structure of the synthetic alpha form, 3/4 of oxygen atoms of the arsenate group are linked to three different Hg-Hg pairs, to form puckered layers. Hg coordination is tetrahedral. Hg2 pairs are in dumbbell configuration. Both α and β forms (synthetic, light yellow) have the same space group. Graph shows reflectance levels at different wavelengths (in nm). Top of box is 100%. Peak reflectance is 18.5–22.8%. (Hg2)3(AsO4)3, a new natural mercury arsenate. 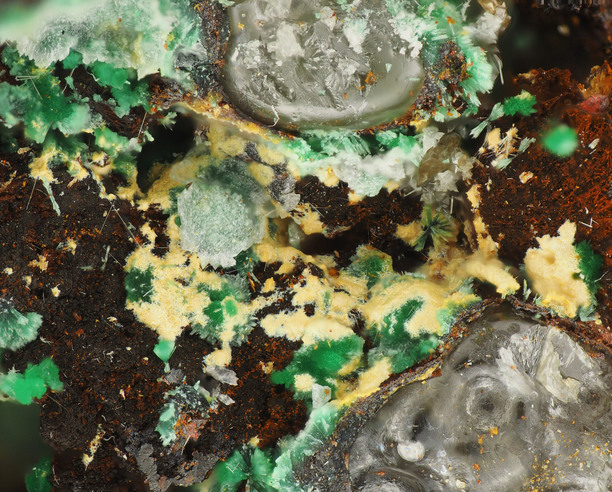 Zapiski Vsesoyuznogo Mineralogicheskogo Obshchestva: 113: 341–347 (in Russian). Kamenar, B., Kaitner, B. (1973): The Crystal Structure of Mercury(I) Orthoarsenate. Acta Crystallographica B: 29: 1666. Weil, M. (2004): A Second Modification of Mercury(I) Orthoarsenate(V): Preparation and Crystal Structure of β-(Hg2)3(AsO4)2. Zeitschrift für Naturforschung B: 59b: 859-864. Leverett, P., McKinnon, A. R., & Williams, P. A. (2005). Supergene geochemistry of the Endeavor ore body, Cobar, NSW, and relationships to other deposits in the Cobar basin. Regolith 2005–Ten Years of CRC LEME, 191-194. EDS and Raman analyzed by Joy Desor.